Buy Minas Ithil on Amazon or find The One Ring supplements on RPGNow. You too can earn money from writing articles by signing up for InfoBarrel. 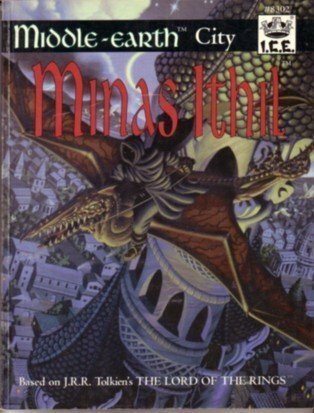 Minas Ithil by Mark Rabuck is a role playing game supplement published by Iron Crown Enterprises (I.C.E.) is the second citybook in the Cities of Middle-earth series for I.C.E. 's Middle-earth Role Playing (MERP), which is set in the world of J.R.R. Tolkien's The Lord of the Rings, and is also compatible with their Rolemaster role playing game system. As with the first citybook, Minas Tirith, this one primarily uses The Lord of the Rings appendices as reference material, with some background also taken from The Silmarillion, Unfinished Tales and The Hobbit. Minas Ithil was released for the first edition of MERP, and is a 121 page softback book. It has a full colour cover and black and white illustrations and maps inside the book, and a separate colour map of the city which is composed of two pieces, which are approximately A1 in size when joined. Credit: David Martin/Iron Crown Enterprises/eGDC LTDMinas Ithil is set, as the majority of MERP supplements were, in the default year of 1640 of the Third Age. The War of the Ring takes place in T.A. 3018-9. This supplement covers the city of Minas Ithil, the Tower of the Moon, rather than the later Minas Morgul, the Tower of Black Sorcery, after its capture by the forces of Sauron. Minas Ithil is both the name of the city and its tower. In 1640, the city is in decline, as is the kingdom of Gondor itself, following internal strife and the effects of the Great Plague. The city is on the borders of Mordor and, although Gondor still maintains fortifications in that land, there are no longer the number of troops stationed there that there used to be. Despite Middle-earth's classification as a high fantasy setting, there are very few spell users detailed in Tolkien's works. Consequently, in order to bring the setting more in line with traditional fantasy role playing games, and allow players to become spell users, spell based magic, whilst still rare, is more common than it is in the books, resulting in spell casters being more common. Introduction is simply an introduction to the City Series, how to use Minas Ithil, and some brief details on the time period during which the supplement is set. The City of the Moon gives a brief history of Minas Ithil, including after it fell to the Nazgûl. The Lands covers the flora, fauna and terrain of Ithilien. Culture and Lifestyle covers the lifestyle of Minas Ithil's residents. Commerce and Industry briefly details the resources and trade in the city and its domain. Politics and Power is set in T.A. 1640, and provides more detail on the various organisations and major political positions, including some enemy organisations, and how they interact. Credit: David Martin/Iron Crown Enterprises/eGDC LTDThe Gondorian Army is about the army. With Minas Ithil being so close to Mordor and, at the time, Gondor's military forces in that region, the army plays a relatively significant role. In City Overview, an overview is given of many of the various major civic works, including the walls and sewers, of Minas Ithil. Further detail is provided on some of these in Layouts. Institutions and Buildings of Note covers various significant, and some minor, buildings in the city. Again, many of these are further detailed in Layouts. Minas Ithil in Other Times covers the city at other times in the Third Age, although this is the most useful is during the earlier Kin-strife, which was only about two hundred years prior. After 2002, the city became Minas Morgul, which is not covered, and after the War of the Ring, it was razed to the ground, making this supplement essentially useless for those latter two periods. Personalities of Note covers the major non-player characters that can be found in the city, and some that the players are likely to encounter. Adventures in Minas Ithil has a number of short adventures based in the city, as well as some adventure ideas. Adapting this Module is a very brief section on how to use this supplement with other game systems - basically, Advanced Dungeons & Dragons - than MERP or Rolemaster. Credit: Iron Crown Enterprises/eGDC LTDIn Layouts, plans of various buildings in Minas Ithil are detailed, many of which are accompanied labelled details. Tables is simply a collection of various stats. The final section, Selected Reading, is mostly a bibliography. Layouts is the largest single section of the supplement, as it is getting on for half the size of the book. It contains black and white floor plans of buildings in the city, some of which are comprehensively detailed, whilst others simply have the various locations in the buildings named on the floor plan. The basic overviews of the buildings, not the itemised descriptions on the layouts, are copied, usually word for word, from those that described said building when it was listed in either City Overview or Institutions and Buildings of Note, resulting in a fair amount of duplicated content. Credit: Iron Crown Enterprises/eGDC LTDAs the city was conquered by the Nazgûl in T.A. 2002, which is less than four hundred years after the temporal setting of this book - and this sourcebook does not cover its later incarnation as Minas Morgul at all - the book is rather inflexible regarding when it can be used, as there is only a limited amount of in-game time when the supplement is actually useful, unlike other supplements which do at least have some utility in other time frames. Minas Ithil is not as good as the Minas Tirith book which, unlike this supplement, still has use after T.A. 2002, which this one largely lacks. The duplicated descriptions in the Layouts section, plus the fact that many of those pages are only partially filled, make the book seem like it has been padded out to be longer than it actually is. With ICE having lost the license to Middle-earth in 1999, this book will never be available as a PDF. The only way of getting hold of this version is by acquiring it second hand. New Middle-earth material, The One Ring, is being published by Cubicle 7. Minas Ithil is an interesting read, but not the best city supplement available.